When you first entered the workforce, which one of the 5 "C"s did you target for? For most of us, it had to be the credit card. It was like an affirmation that you have reached a certain point of your life and owning one elevated your status in society. 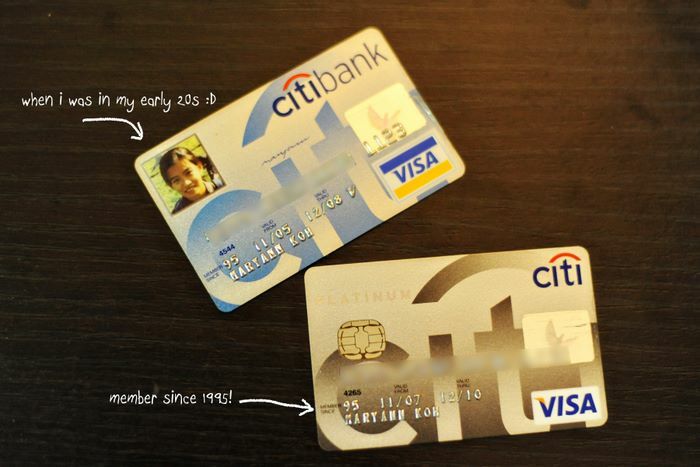 Back then, the card to own was a Citibank Credit Card. Their marketing campaign made me desire to own one more than any of the other cards. Two years after I started work, I owned my first piece of plastic, one from Citibank no less :p Check it out, member since 1995, that's 15 years! The credit card has certainly come a long way since 1995 as I learnt from an evening out with some folks from the bank. I didn't know that my Citibank Platinum card earns me 5X rewards at every department store, supermarket and hypermarket islandwide! And that I could redeem for absolutely anything with my reward points! Had I known this, I would have been using my card more often when grocery shopping, DUH! There's also complimentary travel protector, 5 years validity of rewards and this I know because I shop at TANGS occasionally - you receive 6% rebate at TANGS all year round. Another card that caught my eye, the Citi SMRT Platinum. It turns your daily spend into savings, combining the convenience of an ez-link card and the benefits you enjoy as a Citibank cardmember. This card earns the most rebates islandwide at your favorite merchants and you can use these rebates to redeem for vouchers and free rides. This is great for me because I take the MRT to the studio and getting rebates for each trip sounds pretty good to me! There are quite a few other cards to suit your lifestyle, choose one that suits you with the Citibank Card Recommender. For example if you drive, there's a card that offers you cash back on petrol. If you love to travel, there's a card that offers you 2 Citi Miles for every S$1 spent and no expiry on Citi Miles! For the shopaholics, there's the TANGS card that gives you 10% shopping rebate at TANGS all year round and there's also the Paragon card. I think the best part about Citibank Credit Cards are the dining deals offered in their Gourmet Pleasures program. As we eat out a lot during the weekends, getting a great dining deal with each meal for our family of 4 really adds up every month. * Successfully apply for both a Citibank Credit Card & Citibank Ready Credit to enjoy a $40 TANGS shopping voucher plus first year annual fee waiver. Do contact me if you need more information. Plastic is great when you spend within your means and the rewards and privileges that comes with it are absolute bonuses!